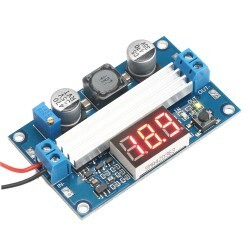 It is a 100W Adjustable Voltage Regulator/Adapter/Power Supply Module, Input Voltage: DC 3~35V, O.. It is a Car Charger Voltmeter Thermometer with 5V 2A Chargers Usb,Input voltage: 12V/24V,Suitable models: Universal type USB Samsung phones Motorola / Motorola, Dopod Soar / SONY Sony Ericsson Nokia Apple Ipod etc. Interval of 10 seconds shows the voltage and temperature in turn. Suitable models: Universal type USB Samsung phones Motorola / Motorola, Dopod Soar / SONY Sony Ericsson Nokia Apple Ipod etc.